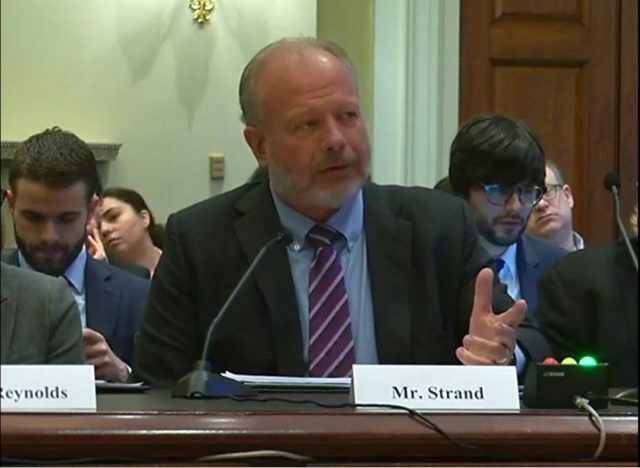 Congressional Institute President Mark Strand testified today before the U.S. House Select Committee on the Modernization of Congress, telling lawmakers that they have a chance to promote meaningful reforms to make Congress effective. Strand’s testimony was based in large part on two research papers the Institute has published: “Lessons Learned from the 1993 Joint Committee on the Organization of Congress” and “Joint Committees on the Organization of Congress: A Short History.” It has been said that those who do not study history are doomed to repeat it. The lessons of previous reform committees create a runway to success for the Members on the Select Committee on Modernization. Strand encouraged lawmakers to think big, saying there is peril in thinking too small. He also cautioned them to be pragmatic in the reforms they recommend. “First, the deadlines you have are important, but they should not be seen as the end date of your work nor the expiration dates for your ideas. Developing ideas creates an inventory of reforms that Congress can implement in response to a crisis or if there is a sudden critical need. Past reforms have been able to improve the capacity of Congress to operate more effectively by simultaneously proposing reforms that provided value to their constituents. In the 1940s, as a result of World War II and the New Deal, the Executive Branch had become so large that Congress no longer had the capacity to provide its constitutional check on the Administration’s power. To maintain the balance of power between the Executive and the Legislature, Congress had to reform. There is little doubt that the budget process has broken down as evidenced by the 35-day shutdown. Fix that and the American public will see that additional resources invested in Congress are necessary to make budget, authorization and appropriation process better. As important as it will be to win over the American public, there’s another group of people who need to have “buy-in” for the reforms: House colleagues, especially committee chairs, ranking members and leadership. The Congressional Institute interviewed Representative Lee Hamilton, who chaired the last Joint Committee on the Organization of Congress in 1993. He said, “The powers that be, the leadership and committee chairmen and the rest become wary. They see a shakeup coming, they see changes coming, and that could mean that their own power base would be disrupted.” Hamilton spoke from experience: the Legislative Reorganization Act of 1994 died off when Speaker Tom Foley intervened at the Rules Committee. This Select Committee will wrap up its work at the end of the year. That doesn’t mean their efforts have to stop, Strand said. The 1970 Legislative Reorganization Act was adopted a few years after the Joint Committee that recommended it was disbanded. Reforms developed in the 1990s by the Democrat-run reform committee were later adopted by a Republican House majority. “A few years from now, someone will say, ‘The 2019 Kilmer-Graves Committee had this great idea; let’s adopt it.’ Aim big and understand that work is part of the history of Congress, not a short-term solution,” Strand said in his testimony. At first, this was done by public vote, but reformers eventually won the right to a secret ballot. In 1973, the Democratic Caucus created the Steering and Policy Committee, which would make all committee assignments (except for the Rules Committee)—until then the prerogative of the Ways and Means Committee Democrats. The Speaker was put in charge of the Steering and Policy Committee, giving him control over committee assignments for the first time since 1911, when Speaker Joe Cannon was stripped of many of his powers. The Speaker was also given the sole power to name the Rules Committee Democrats, making it truly ‘the Speaker’s Committee’ once again. These reforms occurred within the Democratic Caucus and Republican Conference, not under the auspices of a joint or House select committee. Nonetheless, they are among the most significant in shaping how the House operates today. They show how important it is to consider different avenues for reforming how the House operates. One or both of your party organizations might be the best place to advance reform today. Last year’s Joint Committee examined how Congress could improve its budget and appropriations processes. No one disputes that these two functions are, well, dysfunctional. And that dysfunction along with a broken authorization process erodes congressional authority by ceding the basic responsibility of directing federal dollars to the Executive Branch. Unauthorized appropriations have grown significantly since the Congressional Budget Office began reporting on them pursuant to the Balanced Budget and Emergency Deficit Control Act of 1985. For fiscal year 1987, Congress provided over $33 billion without authorizations of appropriations. Adjusted for inflation, this amounts to nearly $73 billion today. For fiscal year 1988, the number climbed to almost $45 billion. Adjusted for inflation, this is approximately $99 billion in 2017. Compare that to recent years. For fiscal year 2015, Congress made $294 billion worth of unauthorized appropriations and $310 billion for fiscal year 2016. As the years have gone on, Congress has generally been unable, or unwilling, to limit the growth of unauthorized appropriations. The more Congress refuses to authorize programs yet still appropriate dollars – and perform oversight to ensure money is being spent properly – the more it cedes this power to Executive Branch agency and department heads and other unelected bureaucrats. This isn’t a new problem. [T]he first Joint Committee on the Organization of Congress (1945-1946) … established the tradition of engaging in a wholesale reform of the Legislative Branch, using a joint committee as the venue for examining the issues and proposing reforms. … Also, it addressed many of the same issues that Members are concerned about today, like the committee structure, congressional resources, and relations with lobbyists. Their efforts culminated in the Legislative Reorganization Act of 1946, which, among other things reduced the number of standing Committees in the House from 48 to 19 and the Senate from 33 to 15, provided increased staff and money to run Member offices, required lobbyists to register, increased Member pay and provided for a civil service pension. Reform committees come around every 20 or 30 years, and they make meaningful and impactful changes to Congress. The last significant reforms occurred in the early- to mid-1990s. We’re due for another reform committee to recommend how Congress can strengthen itself, make itself relevant and reclaim its rightful place as a co-equal branch of our government.